Winner of “Song of the Year” (2000) for “Silver Spur” from the Academy of Western Music, Terry Brown has toured for over 20 years and performed with Chris LeDoux, Aaron Tippin, Toby Keith and Brooks and Dunn as well as other major stars. He was also nominated for “Album of the Year,” “Male Vocalist of the Year” and “Rising Star” by the Academy of Western Artisits (2000). Terry is know as “The Louis L’Amour of the Cowboy Singers.” Hearing one of Terry’s western songs is like reading a good western novel, only it doesn’t take as long. Having performed his music at hundreds of rodeos and venues around the country, Terry knows a little something about the cowboy spirit and has a deep respect for our western roots. With a catalogue of over 1200 songs and over 70 songs recorded by other acts, Terry’s songs have appeared on millions of records worldwide. Terry has the kind of voice that is perfectly suited for the storyteller role. Its depth and emotional quality make you believe the stories he sings and makes you want to hear them again and again. There have been many artisits who have helped preserve our western heritage but few can paint a more beautiful or realistic picture of the cowboy and the west than Terry Brown. 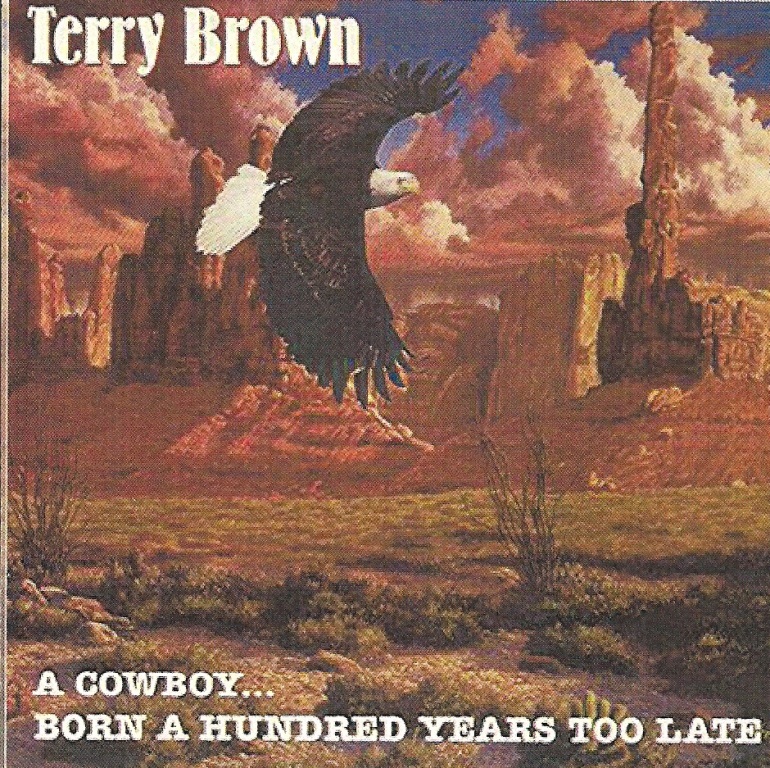 Terry recently re-released his “A Cowboy…Born A Hundred Years Too Late” CD and was kind enough to send it to me. As well as the title song you can also hear “Ode To The Cowboy, ” “Silver Spur,” “The Drover,” “Run With The Devil,” “Land Of The Gun,” “Rockin’ Chair Cowboy,” “Ain’t This Fun,” (cowritten with Mark Lister) “The Ride Of My Life” (co-written with L. David Lewis and Kim Williams)and “Nobody Wants To Be A Cowboy Anymore.” All songs either written or cowritten by Terry Brown. What a wonderful CD! The songs tell great stories and Terry does a super job with each and every one! You can download songs or contact Terry at www.terrybrownmusic.com. You do have to have Adobe Flash Player to access the site, but you can download it for free. His new video “Rockin’ Chair Cowboy” is available on the website as well. You will enjoy it!